Homeschool records are a key responsibility for homeschooling parents. Keeping a high school transcript is always important. Colleges or employers may want to see a high school transcript, or could ask about credits and grade point averages. Insurance companies may require a high school transcript so the child can get a “Good Student” discount, which can save serious money. Summer camps and internships may require a high school transcript as well. Being prepared with this simple piece of paper can make all the difference! I'm a visual learner - are you? Here are some links for visual learners who want to see a course description and transcript examples. 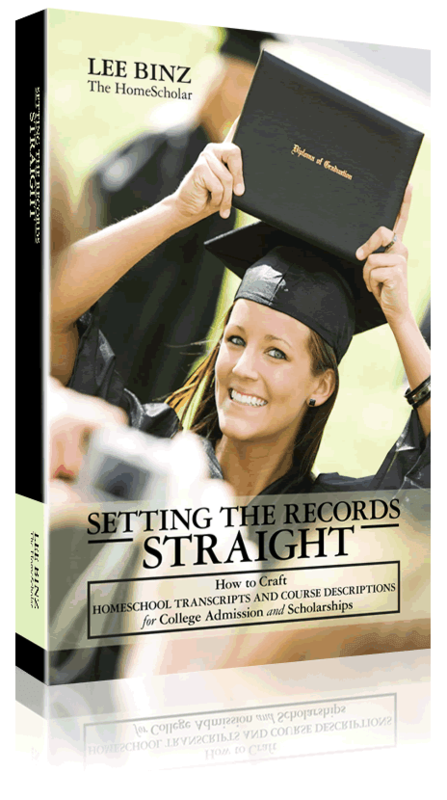 These transcript and record keeping samples and many more are captured in my book, "Setting the Records Straight, How to Craft Homeschool Transcripts and Records for College Admission and Scholarships." Are you ready to create your own scholarship winning transcripts and records? Get all the training, templates and copy-paste course descriptions you will need to get the job done quickly! Click to get the Comprehensive Record Solution. If you want a great introduction to the How and Why of producing Comprehensive Records for your high school student, check out my Free Webinar: Homeschool Records that Open Doors! That class will review all the records you might need to make, and show you how to get the job done more simply and with less stress.